CLIENT INTERVIEW in this month ONWARDS. LATEST UAE SHUTDOWN JOBS CONTACT DETAILS. SUPERVISORS : Mech, Piping, QA/QC. MIN. 3 YEARS OIL & GAS EXP. IN GULF. 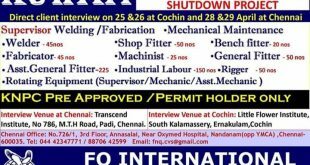 UAE SHUTDOWN PROJECT.HUGE VACANCIES FOR SHUTDOWN. I am Pipe and Struture Fabricator,my work experecince 15 Years gulf country Shutdown and Job. I am a fresher in QA/QC in oil and gas, piping. Can you please take me for any shutdown jobs. i’m johnny Quijano, ill been painter with 5 years..can i apply as a painter with your company..if you need painter..
How to apply sir/ mam..
13YEARS OIL & GAS EXP. IN GULF. Having had 11 years of Dubai in UAE 1 year K.S.A Sr. Store Supervisor experience in the segments of projects ETA Star Engineering & Constructions (Ascon Road Division, Building, Central store, Workshop I am currently looking for a suitable General Site Supervisor or Storekeeper in your esteemed organization. In this regard I am herewith attaching my CV for your kind perusal. At present I am on a Saudi Arabia employment visa, residing in Taif. I believe that the my experience has prepared me well and not only will I be a long term asset to the company but also make a marked value addition to the company’s future goals and visions. In the meantime I thank you for reviewing my application and very much look forward to hearing from you at the earliest. sir iam a instrument technician & iam 19 years old can i do job in gulf contries? sir I have worked as piping foremanl various Clint’s such as Adma adgas Vasco and Zadco in Abudhabi. DAS ISLAND UAE. I’m searching job like a timekeeper.I’have gulf experience also if you’ve any requirement? Please inform me. I am Pipe and tank Fabricator,my work experecince 7 india 2 years ingulf exp I want Shutdown Job. Hi sir my name is k.ganesh.iam a welder.i have15years gulf exp. A/c technical opening i an attaching my CV here please note it kindly consider this while recruiting. I worked as a driver in saudi arabia 10 yrs have saudi valid LicenseECNR Passport speaking Arabic English Hindi urdu High Secondary Interested Shut down job . Iam Ramesh ch.age 40,B.com, Iam working in OIL COUNTRY TUBULAR LIMITED. Nalgonda, T.S.As a TIMEKEEPER from 2004.India experience .Please send the details. I am mr. Anirudh Kumar Sharma for HVAC Technician.my total experience 7 year. 27 month gulf experience. I intrested for sutdown.my contact no.9628223194/9161462192. I pipe fabricator , gulf exp. In 8 years, I want shutdown job. 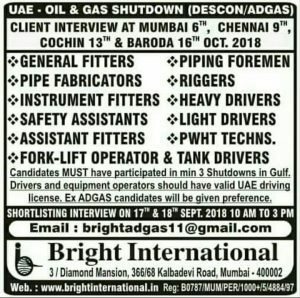 I have 6 years more than 12 shutdown experience in Ras Gas-Qafco-qatargas Qatar, Gasco Ruwais & Hubshan Abudhabi, AdGas-Dasisland. As an Admin Staff / Site Admin / Sr. Time keeper. You have requirement for Relevant of my job. I am a graduate Nurse with 9 years of experience in healthcare in Medical emergency and casuality. I have been working with oil and gas industry with 4 years. Look forward to apply for the position for the post of Male Nurse for short-term and long-term gulf job.